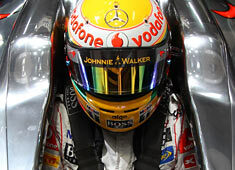 During the technical presentation of the MP4-27 at the McLaren Technology Centre earlier today, Lewis Hamilton expressed how much he is looking forward to the beginning of the 2012 season after following the development of the MP4-27 keenly over the winter. Lewis Hamilton said: “The winter has been a great opportunity to recharge – I got away into the mountains, spent a lot of time hiking and running, improving my fitness and starting to prepare for the new year. “It’s always great to get away from everything; change the scenery. And what’s great about Formula 1 is that you start each season with the baseline completely reset – everybody starts again from zero – and that always makes me so hungry. “I’ve been keenly following the development of MP4-27 over the winter and I’ve been really encouraged by the results and the data that the engineers have been showing me. I think we already had a very strong base to build upon: Jenson and I won six races with MP4-26 last year and I think we’ve been able to retain all the strengths and the reliability of that design while also incorporating lots of improvements and new ideas into the new car. “Of course, the biggest changes for 2012 are the modifications to the exhaust regulations – that will reduce the downforce and grip that we had last year, but it just puts the emphasis on the designers to try and claw some of that back in other areas.